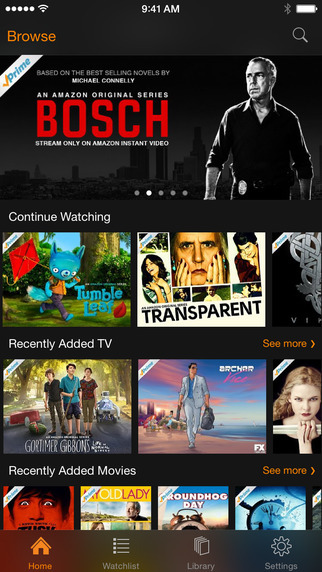 The latest update to the Amazon Instant Video app for iOS devices issued today allows streaming over mobile data plans, a feature users have long been asking for in the app. At the same time, the update also allows users to choose to stream video in HD quality. The new cellular option is a bit of a double-edged sword though. Users will find that video (especially HD quality) devours up data plans a lot quicker than SD. And, those with “unlimited” or “grandfathered” data plans may even find their cellular speeds throttled down so much that HD will just be too choppy to endure. Still though, having the ability to stream in HD while on a high-speed Wi-Fi network was long overdue for the app. The Version 3.0 update also allows users to control mobile data usage and download quality settings. For Apple TV users, the app integrates nicely with AirPlay using 2nd-gen players or higher, and is compatible with HDMI to your TV via the Apple Digital AV Adapter.